Here, on the 19th of April 1775, was made the first forcible resistance to British aggression. On the opposite Bank stood the American Militia. Here stood the Invading army and on this spot the first of the Enemy fell in the War of that Revolution which gave Independence to these United States. That’s the engraving on a monument to the Battle of Concord, dedicated on July 4, 1837. 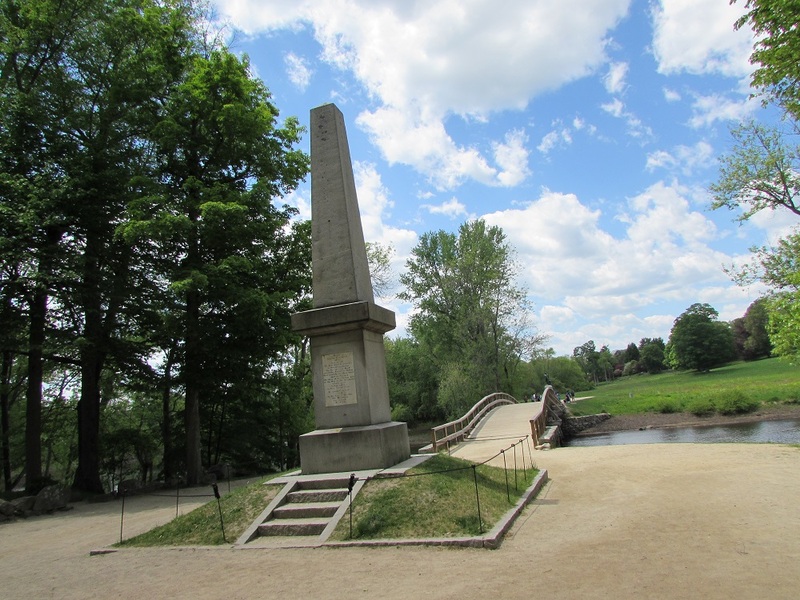 The significance of the Battle of Concord, according to that engraving and to the descriptive sign near the monument, is that it was where colonial militia were first ordered to shot at British soldiers, thus actively committing treason. There’d been a skirmish between British and colonials earlier in the day in Lexington, just a few miles away, but in that conflict, the colonials had been reactive, not proactive. I tweeted that fact (because it was new to me) and a second later, there came the first of the rebuttals. The standard bearers of the Battle of Lexington would beg to disagree. It was in Lexington that the first voluntary action against the British was made, they said. Concord could eat Lexington’s dust. Gentlemen: shake hands and return to your corners. Who shot first when doesn’t make any difference — at least, not to me. The important thing is that there was battle, in Concord, on April 19, 1775. British troops had set out early that morning from their base in Boston, their goal to destroy ammunition and supplies that the colonists had stored in Concord. On their way to Concord, in Lexington, they were met by Massachusetts militia and Minute Men. No one knows who fired the first shot, but somehow a skirmish ensued, one that’s generally acknowledged to be the first battle of the Revolutionary War. By it’s end, eight colonists were dead — no British — and the British marched on to Concord. 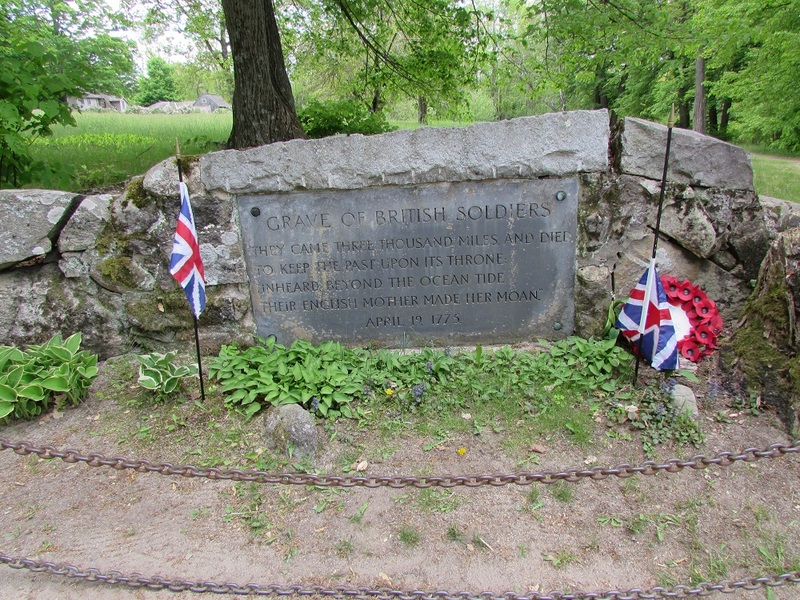 In Concord, the British began destroying supplies and the colonists fought back. This time, the colonists won and the British fled back to Boston. 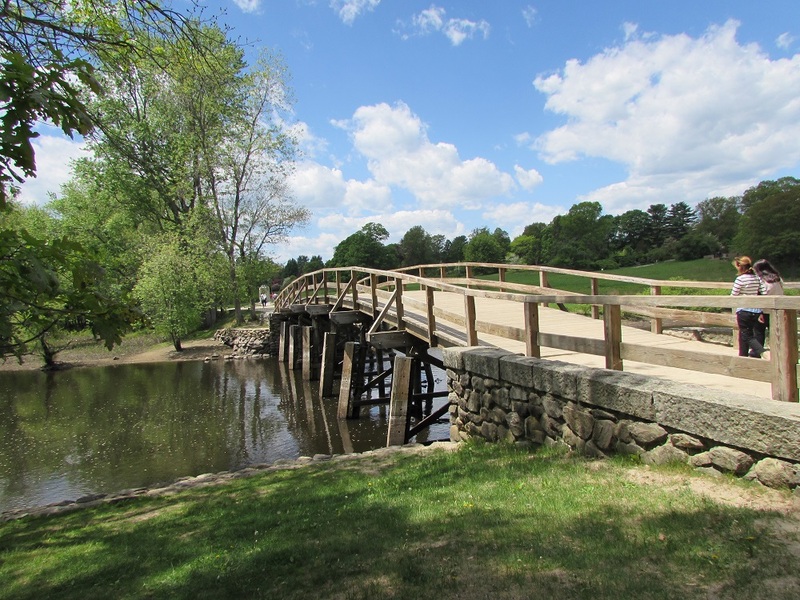 The “rude bridge” is the North Bridge, less than a mile from Concord village center and it was there that the British and colonials engaged. It was also there that Kathie and I took our sandwiches from the Concord Cheese Shop. We had a picnic at a table near the car park before walking the few hundred feet to the monument. Next to the monument is the grave of two British privates killed there. They know that three were killed and they know their names, but which two are buried in this grave is unknown. The third was taken — why and by whom is also unknown — into central Concord and buried there. There wasn’t a bridge at the site in 1837 when the monument was erected there. The one that had been there during the battle had been taken down in 1788. There’s one there now — the sixth iteration — built in 2005. I’d always had the vague notion that “Minute Man” was an alternate term for a militia man. I finally learned, on this trip to Concord, that a Minute Man belonged to the “professional” arm of the Massachusetts forces. They were better trained than the militia and were paid for their time. I liked the description one military website gave of the Minute Men’s specialty: rapid deployment. Thus their moniker. On the other side of North Bridge is a statue of a Minute Man, designed by local sculptor Daniel Chester French (he won a contest to design the statue). It was erected in 1875, for the 100th anniversary of the battle, and made with iron melted from seven Civil War cannons. The first stanza of Emerson’s Concord Hymn is engraved in its base. 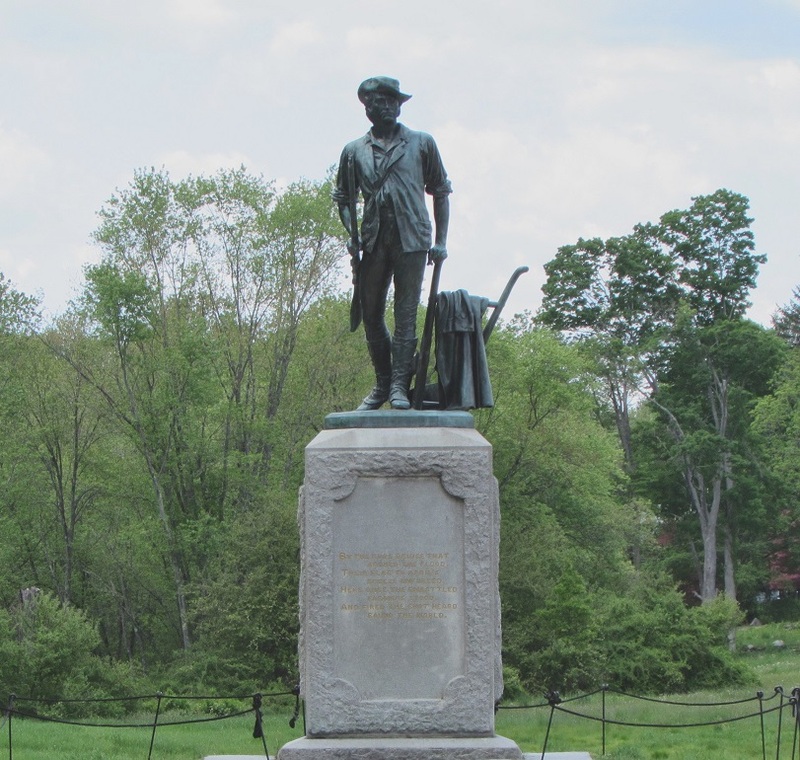 Gallery | This entry was posted in Massachusetts and tagged Battle of Concord, Daniel Chester French, Minute Man Statue, North Bridge. Bookmark the permalink. Interesting inscription on that British soldiers grave. It’s the second half of the third stanza of a very long poem called “Lines Suggested by the Graves of Two English Soldiers on Concord Battleground” by James Russell Lowell.